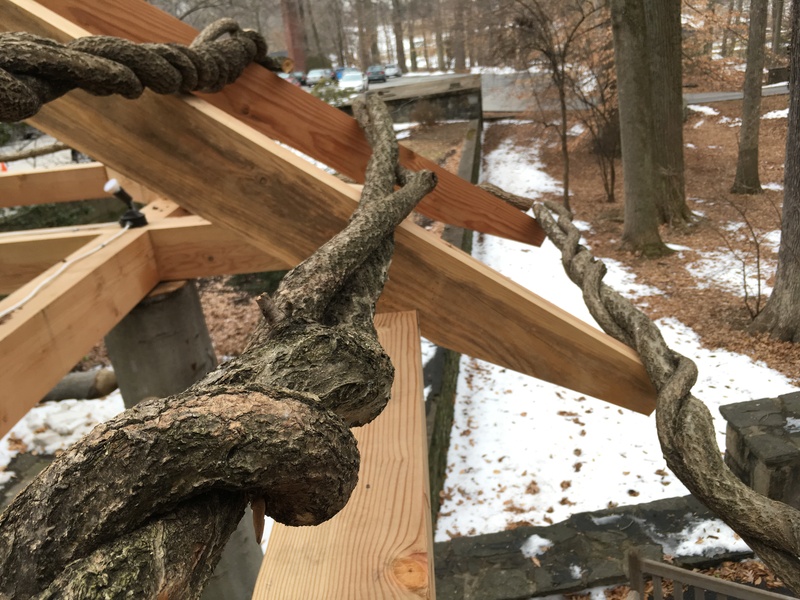 We have entered the countdown to the April 1st opening of the Winterthur Garden’s first outdoor exhibition, Follies: Architectural Whimsy in the Garden. It has been a day that I have been dreading for a while but as it moves ever so closer, the anxiety has lessened, being replaced by a mix of anticipation and adrenaline and, on April 2nd, a chance to catch my breath. As with all construction, some follies are ahead of schedule, some are behind, but all are progressing forward and for that, I am thankful. So, to get this “folly train” movin’, in true countdown form, a new folly will be featured each week, which will take us to the week of March 18th, and the week preceding the opening, March 25th, we’ll feature the reason behind this exhibition; our own historic follies. I will start with the folly that is closest to completion but will intentionally leave out some of the finishing elements because, well, they are not all finished but also to entice you to come in and see the follies for yourself. I will start the folly-frenzy countdown with the Green Folly. This is a concept that we swirled around in our heads for a while; what would this folly be? In the conceptual phase, we spoke of this folly reflecting the garden yet it took a trip to England to come up with the bones of this folly. It was a visit to Prince Charles’ garden Highgrove that a spark ignited our Green Folly imagination. Folly at Highgrove that served as inspiration for our own. The appeal of this folly, for me, was the use of the massive tree trunks as the pillars holding up the roof. 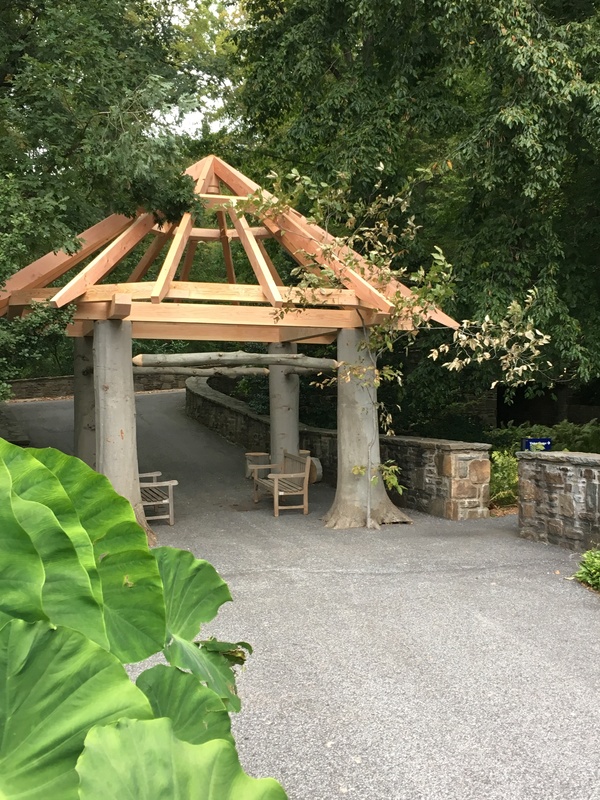 Anyone who has walked the Winterthur Garden and wider estate marvels at the size of our trees and in fact, we have several state champions on our property. Trees are both the bones and the soul of the Winterthur Garden and this Highgrove folly captures the grandeur of trees. Bringing the concept back home and flushing out some details, we came up with the framework of our green folly. 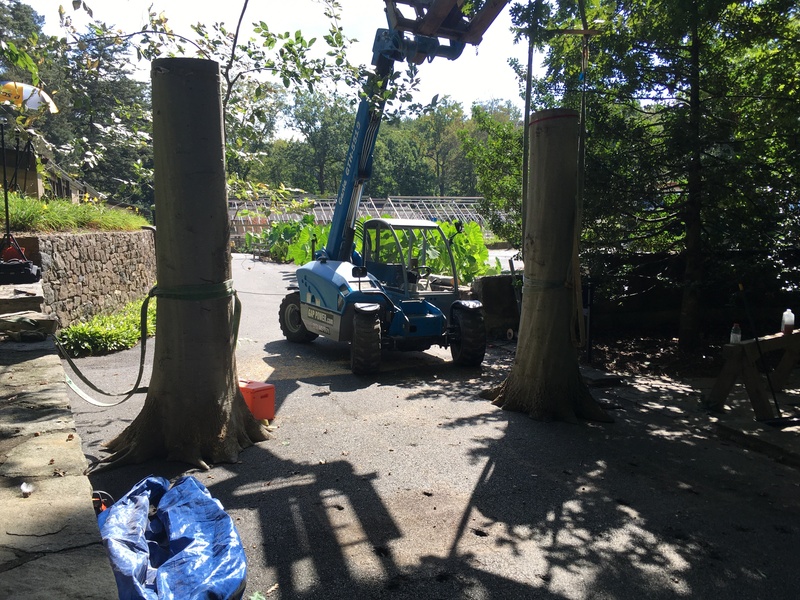 For the pillars, we chose to go with a tree that is throughout the property: American beech. The smooth, grey bark contrasts the darker, furrowed bark of other species in our forests and no trunk flair is as consistently dramatic as beech. For the roof, we could have gone with thatch but we already have two thatched roofs in Enchanted Woods. 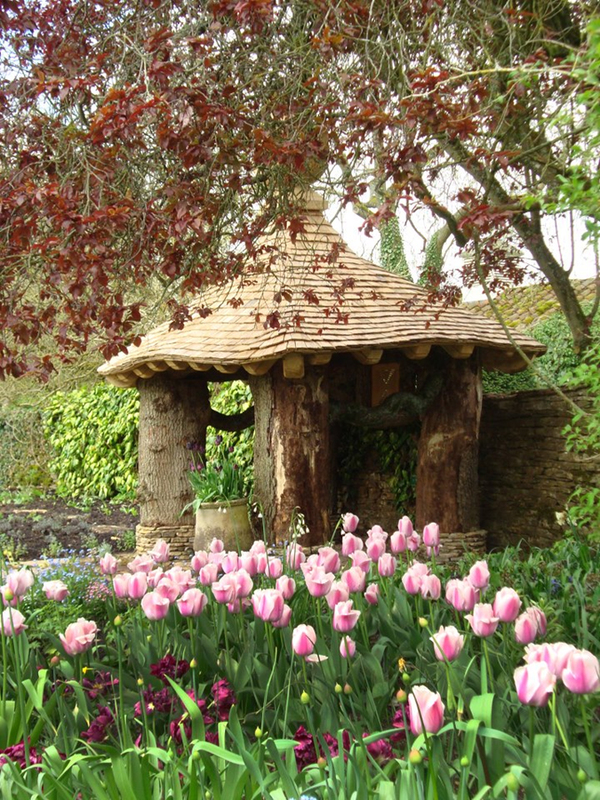 Cedar shingles are used on two of our featured historic follies, the Umbrella Seat and the Bristol Summerhouse, but we don’t have any bundled twigs featured anywhere…so in came that idea. 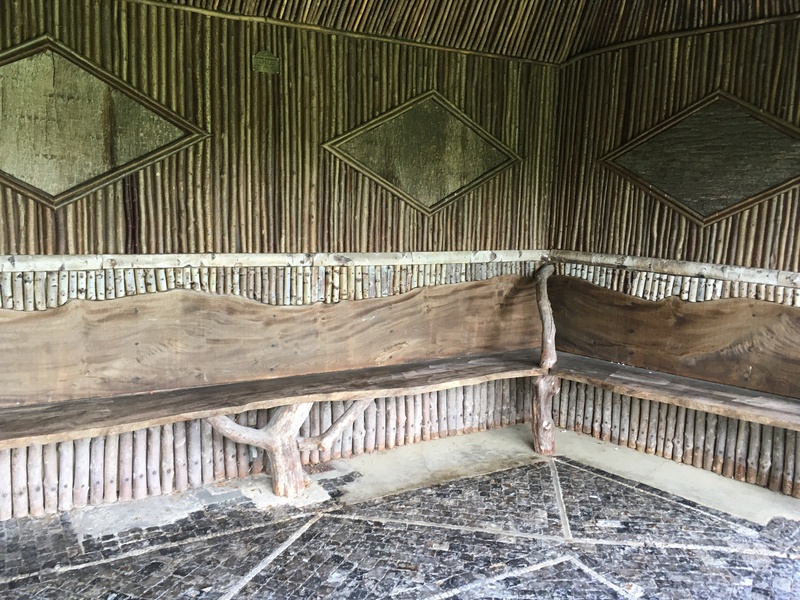 Seating and wall at a folly at West Dean. 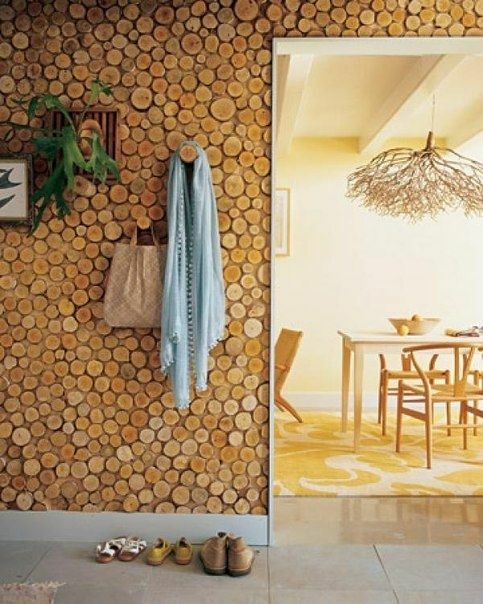 Original wall inspiration courtesy of Martha Stewart. We approached Hugh Lofting Timber Framing with the concept of helping us build the folly. Over 40 years in the business, they never have built something quite like this. 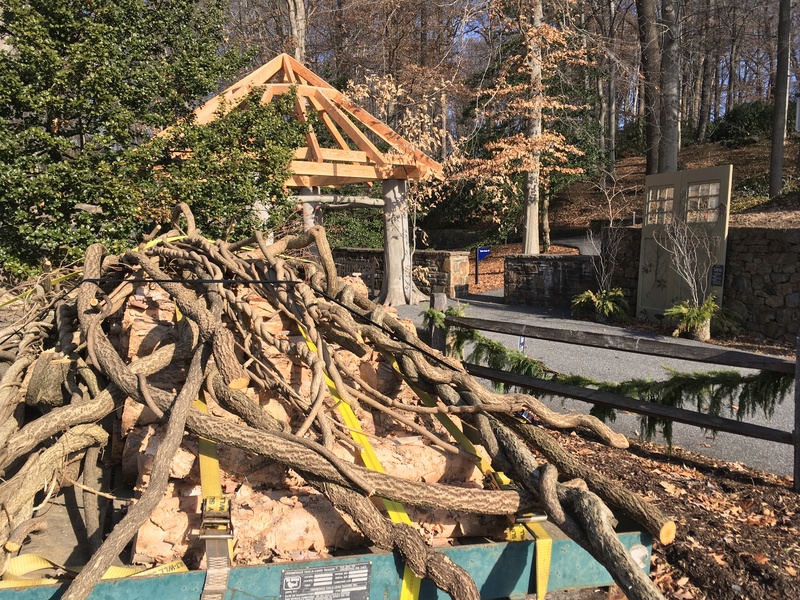 They accepted the challenge so our arborists scouted the grounds, looking for trees with the right dimensions and evenly-flared trunks that were also easily accessible for removal by a crane. Brandywine Tree and Shrub had all the right equipment to gently remove the trees and move them to the location. Skillful cutting of the beech. Setting of the two front pillars. Not your average timber framing project! Months of planning got executed in 2 weeks, from cut to assemble, to create the bones of the folly in time for Truck and Tractor Day. We did not want to miss that opportunity to whet the folly appetite at that event! Green Folly structure completed. Now for embellishments. 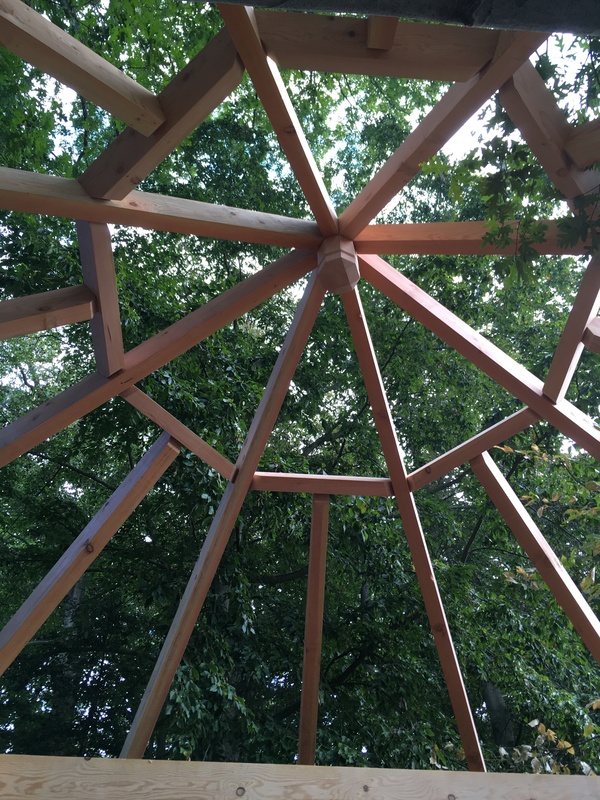 At the completion of the timber framing, we decided to not fully “twig” the roof but leave the top portion open to look at the canopy above and the wonderful pattern of the framing. A decision inspired by the moment. Roof design highlighting canopy. Too pretty to cover completely. Illuminated at Winterthur After Hours. Branches from the removals were piled in our fields. The original thought was to use bundled branches without leaves but the removals occurred while in full leaf and true to beech, the leaves persisted. That would be a lot of leaves to remove by hand…and beggars can’t be choosers so the design changed to include leaves on the twigs! Those piles were sorted and then later bundled. 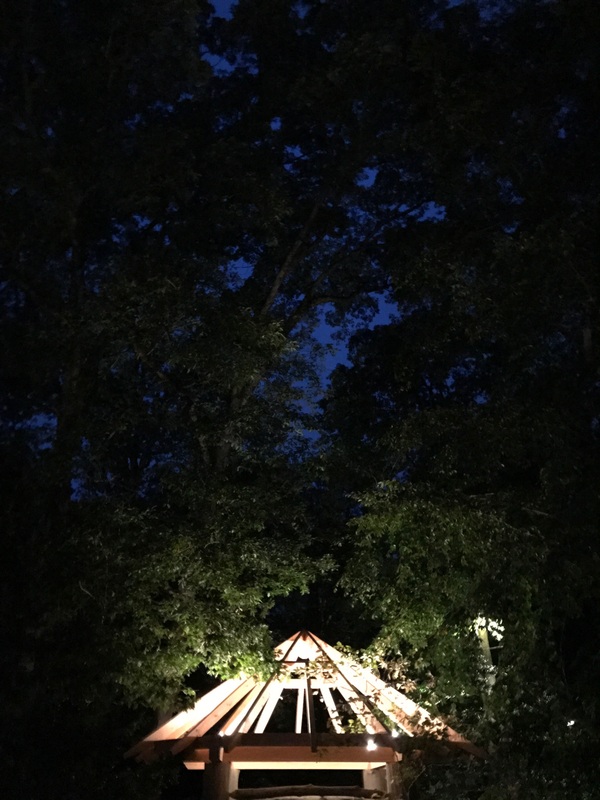 A sidebar of this story, Enchanted Woods had a lot of improvements this past year: the installation of a new hand pump and plumbing, reworking of the stone pathways, replacement of the exposed timbers on the Faerie Cottage and some thatching repairs. Fortunately, for me, the thatching was the last to occur and William Cahill extended his stay to help in our “twiggery” (our made up name for twig roofing!) We placed grapevine and bittersweet vine down as the “rafters” and then attached the bundled twigs (with leaves) to it. 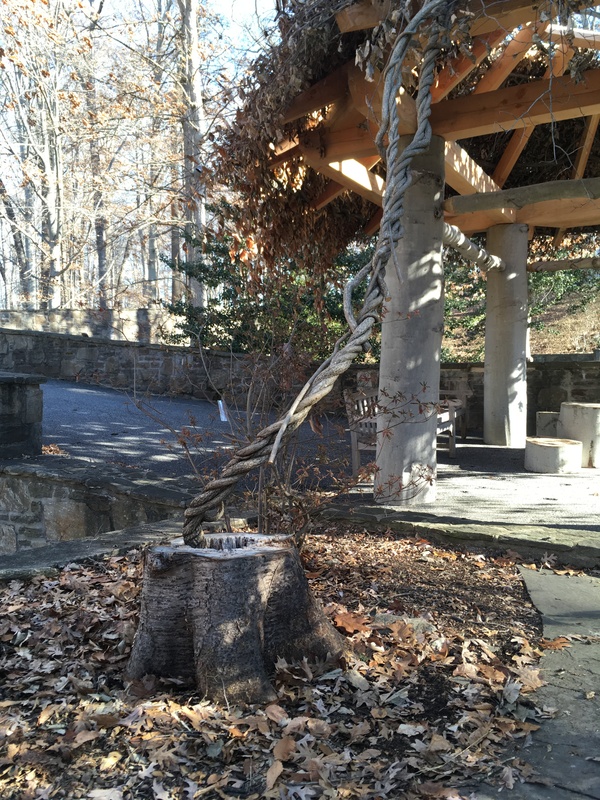 A piece of braided vine did not make it to the rafters but instead comes out of a stump and provides the illusion that the rafters stem from this living connection to the ground. Again, some decisions made in the creative process. “Living vine” sprouting from a tree stump. The seat design evolved with the stacked wall idea, with two pieces of the wall being longer, forming a cantilevered seat. Then came, “Wouldn’t it be neat if there was a window in the wall?” Enter blacksmith Seth Barchowsky who created the oval framework (embellished with leaves) for the window. Oh, did I mention that the wood for the wall came from river birch trees removed earlier in the year from my property? 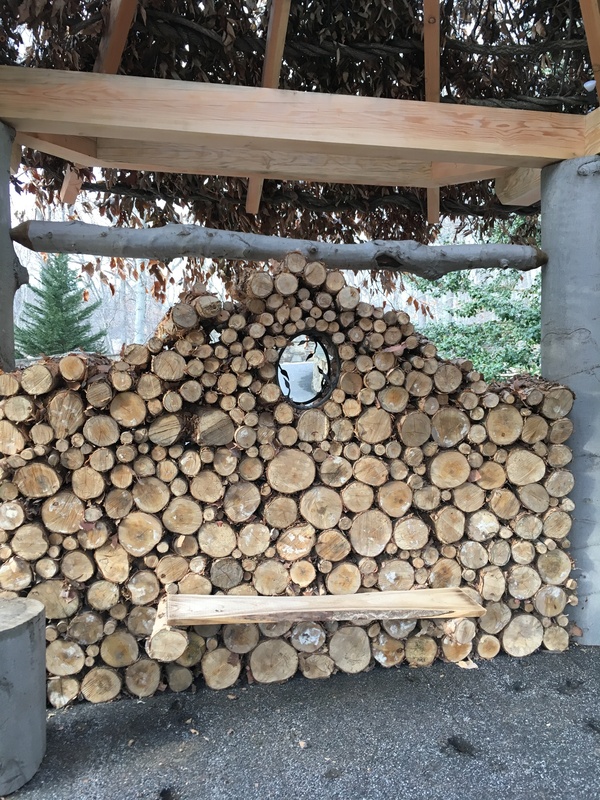 At the time of their removals, I was not sure how or if we would use the logs but I figured that the ornamental bark of the birch logs had folly potential. As of this writing, the wall is not yet completed but one can get a picture of what it will look like. 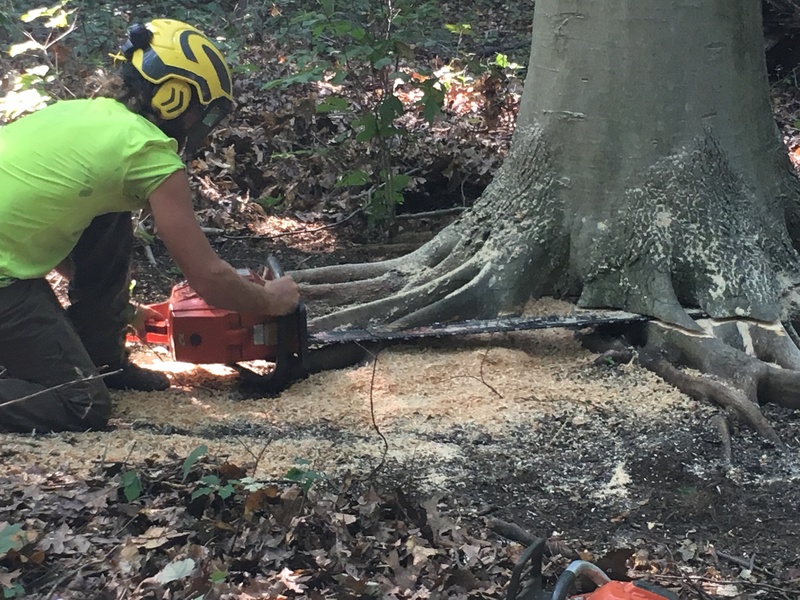 Cut wood for walls and vines for rafters, courtesy of our arborists! A not yet finished wall and seat prototype. The finial is the last piece to go on. We approached Ron Brown, who turns bowls from Winterthur wood for our gift shop, to turn a piece for us. (check out his work in our Clenny Run Museum Store!) We chose an urn whose contents we could alter seasonally to reflect the changes in the garden. 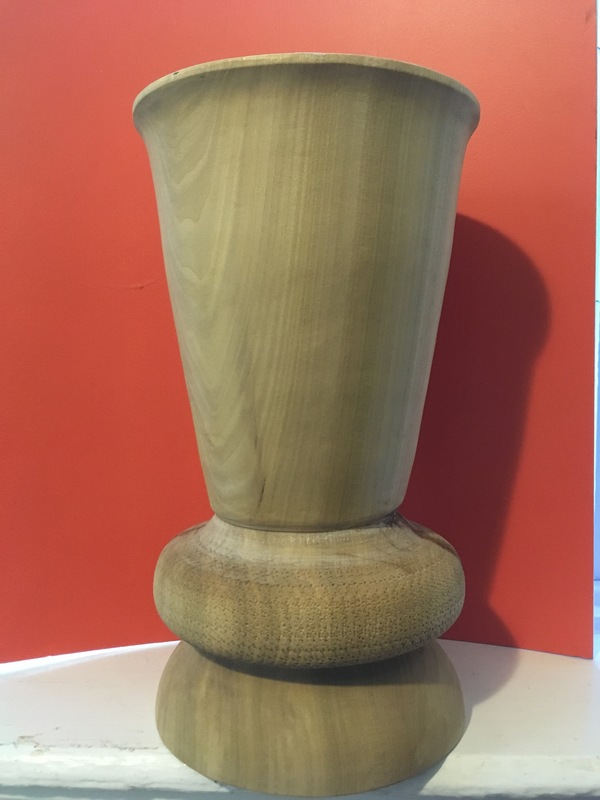 Finial turned from Winterthur wood. As you can see, there have been many hands involved in the creation of this folly: in all of our follies, really. Each person who has been involved has had a bit of a twinkle in the eye about their particular part in its creation. A collaboration of professionals and craftsmen with years of experience, but not on a project quite like this. The construction of each folly brings out the kid in us and that unbridled imagination is just the inspiration that is needed to create these whimsical structures. I don’t know where to begin. What comes to mind first is how this folly demonstrates a perfect balance between planning and serendipity. You boldly launched the original idea and then allowed the creativity to flow all the way through fabrication – and the detailing is exquisite. The heavy trunks are sobering and the detailing adds whimsy and delight – the cantilevered bench is brilliant. I can’t wait to experience this in person. Thank you so much for the kinds words, Gary. You, more than anybody, know how serendipity adds that extra something. It has been great to work with many people who have allowed their minds to be open and creative.